I did my best to spread out appointments and procedures between the members of my support system. I didn’t want any one person to feel burdened, especially Mark. He would have enough on his plate taking care of me at home. My friend Sharon accompanied me to my pre-surgery checkup, and my sister-in-law brought me to get the radioactive isotopes injected. As part of my own self care regimen, I took selfies of me with each person to accompany me. I snapped photos of the intimidating machine they used to guide the placement of the radioactive seeds and the nuclear scanner I rode like a carnival ride following the isotope injection. I wanted to document my progress and witness my own milestones of treatment. No matter how much support I had from friends and family in waiting rooms, I faced the painful procedures alone in a skimpy hospital gown. There comes a time when every cancer patient is stripped of their own clothes and identity. We may be in the presence of medical professionals, but we are profoundly alone. In those moments, we must rely on ourselves and our own coping skills, which can take the form of tears, desperate prayers or stoically enduring the pain and humiliation. If we are lucky, we have access to other more concrete coping techniques. As a child life specialist, I had helped children and families document their treatment through photos and homemade books. Children illustrated their stories and dictated their own narratives. I prepared many children for painful procedures, and provided distraction and comfort to them while they faced injections, spinal taps, bone marrow aspirations, sutures and the setting of broken bones. With their parents’ help, we practiced how to blow bubbles to relax, how to make choices about where to look during the painful part, and what toys or books might take their minds off their pain and fear. I used guided imagery to help them imagine themselves on a beach or at an amusement park, instead of on a cold, hard, bed in an emergency room. I remember 10 year-old Nikki well. An ambulance transported her from school, where she had seriously injured her right arm. She arrived at the pediatric emergency room on a stretcher, her arm heavily bandaged. She was surprisingly calm, and I wondered if perhaps she was in shock. Her parents had not arrived yet, and the doctors couldn’t wait for them. They moved her onto a hospital gurney. I stood on the other side of the bed, close enough to speak quietly as the doctors bustled around her. “Now that’s original!” I smiled. As I was speaking to her, the doctors began to unwrap the bandages that swathed her arm. I almost gagged at the sight of a large, ragged tear on the inside of her upper arm. The muscle and fat hung from the bloody gash. I took a deep breath and refocused on Nikki’s face. “Beach,” she said quickly. I was frankly relieved. It should always be a child’s choice about whether or not to look, but her wound was ghastly. Even I didn’t want to look! I demonstrated some slow belly breaths, and she complied. Nikki chose to keep her eyes open as I began to guide her into a make believe scene. We continued along this path. I supplied prompts and she filled in the blanks, her eyes locked on mine as the doctors irrigated her arm. This child’s ability to block out the fear and pain, even during the actual suturing of the wound, was remarkable. She stayed on that beach during the whole procedure, calm and engrossed in the fantasy. …..But today it was my turn to be the patient. As I pushed my way through the revolving doors of the very hospital where I had provided solace and healing, it struck me that I was the one in need of these things. Who was going to take care of me, the caretaker? It was such an odd homecoming, familiar yet strange. The actual building I entered had not even been in existence when I’d worked there. But it held the same smell and the decor was familiar, as were the uniforms of the security guards at the information desk. Entering the lobby as a patient, without the authority of an employee ID badge, I felt like a lobster shedding its shell, soft, pink and vulnerable waiting for a new protective coat of armor to form. I had taught children and parents so many coping skills over the years. Would these skills be available to me now, or would terror hijack all of my working synapses and block my access? A rip current of anxiety carried me along a shoreline just out of reach. I could feel my feet scrambling for solid ground. At the check in desk on the 4th floor, I supplied my birthdate, those eight digits that granted me access to the world of treatment. Like a POW stating name, rank and serial number, I would repeat those numbers countless times over the coming months. Mark and I found seats on one of the many couches in the waiting room. Although most seats were filled, there was a hush to the large room. Patients and caregivers sat in small groupings, sipping coffee, reading magazines, texting quietly on cell phones. One woman appeared clearly ill, a greyish pallor smudged over protruding cheekbones. Overdressed for the spring weather, she huddled in her scarf and coat, a hat pulled low over her forehead. She tried her best to curl into her chair, her eyes closed in exhaustion. Was that going to be me soon? Others looked no different than me, dressed for work, no outward signs of illness or distress. Mark pulled out his blackberry and zeroed in on work emails. That and his bouncing foot were his only tells. Soon enough, we sat across a desk from Dr. Fodor, while he drew an anatomical diagram of my breasts upside down, so that we could see it from our seats. I looked over at Mark and our eyes met in shared relief. “Thank God!” I thought. No horrible decision to be made between a mastectomy and a lumpectomy. No chemo. It was mid May, and as a professor I didn’t work summers. This already felt manageable. Dr. Fodor, sporting a bow tie and the lanky build of a basketball player, exuded calm reassurance. This was no big deal. He saw this every day. “So, what do you think about next week?” he said. Mark and I walked out of the doctor’s office an hour later with a schedule for surgery and pre-op appointments. 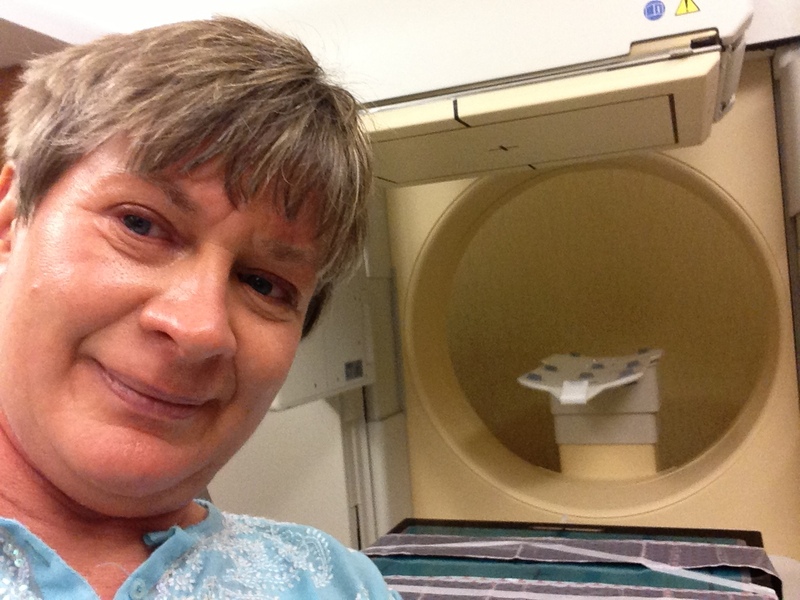 Dr. Fodor had explained that in addition to routine blood work and an EKG, I would need to be injected with radioactive isotopes, scanned, and have seeds placed in both my breasts to localize the tumors and sentinel lymph nodes so that he would know where to cut. It was a lot to take in, but I didn’t have a lot of time to think about it. The very next day, I boarded a plane to Denver to attend the Child Life Council’s annual conference. The CLC is a membership organization for the field of Child Life. It oversees certification, provides support and resources to child life specialists, and runs an annual conference. This year, the Council had awarded me a scholarship for Innovations in Play, and the Disney Corporation would underwrite my trip. I had two presentations to give, both on the topic of play. In addition to the scholarship, the CLC had recently hired me as the project leader to design and conduct an international survey on the state of play in North American hospitals. My career was beginning to expand beyond the walls of the small college where I taught courses in play and child development for child life specialists and teachers. I was excited and a bit overwhelmed by the tasks that lay ahead. Cancer certainly hadn’t been part of the bargain when I signed up for these opportunities. But there was no turning back now. My mother had been diagnosed with breast cancer 6 years earlier. She had a tough time with post surgery complications and the radiation had left her scarred and in chronic pain. But thankfully, she was alive and kicking at the age of 80. A great role model for me, Joyce projected an infectious sense of joy and a thirst for learning and growing. I would definitely be relying on her life perspective in the coming months.